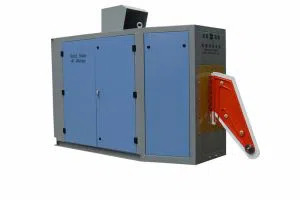 solid state H.F welder is specially designed for straight seam welding. It adopts high power components of US IR IRFP460 MOSFET and Germany IXYS Company DSEI60-06A rapid recovery diode. The high power capacitor C and inductor coil L compose current-mode parallel upper-voltage resonance circuit, which doesn’t need output transformer. Thus, it not only improves the efficiency, but also increases the reliability of the welder. The inverter part is made up by MOSFET single phase inverter unit in parallel type. Each unit has self-diagnostic ability. All the design is to ensure easy installation and maintenance. Automatic load matching system ensures the most efficiency and lowest mill cost. The Control unit installed with LCD, power and motor speed adjust potention meter. Indicate the output current and voltage of the DC power unit. If necessary, it can indicate armature voltage and current of the DC speed adjusting unit. The pipe line can be completely controlled by the central control unit. The input rectifier part to ensure stable power supply and insulate the power grid. 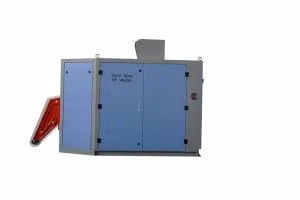 The Water-water Heat Exchanger high efficiency of the radiation, use the seal circulation, outer water cools down the inner water, no scaling. Power grid voltage should be sine wave, : ≤5%. Power net frequency variation: ≤±2% (i.e. between 49 ~ 51Hz). In The Straight Seam Welding Equipment Industry more than forty years. 1. We have obtained ISO9001:2008 Certificate and the CE certificate. 2. Very experienced on Induction Welding and the Heating Treatment. 3.Established Long-term Cooperation with many Steel Groups in domestic and overseas. 1. Professional Technical R&D team. 1. The warranty period is 12 months from the date of installation and commissioning of the equipment.